Bayon Temple at Siem Reap which is located just North from the famous Angkor Wat is another amazing place you must visit when traveling in Cambodia. Missing this temple is like visiting Egypt and not seeing the Pyramids. Bayon was built around 1190 AD by King Jayavarman VII and is a Buddhist Temple with Hindu elements incorporated in it's design. The temple also represents the intersection of heaven and earth. Getting to Bayon Temple is usually after your visit to Angkor Wat and your tuk tuk driver or guide will take you there unless you have other plans. 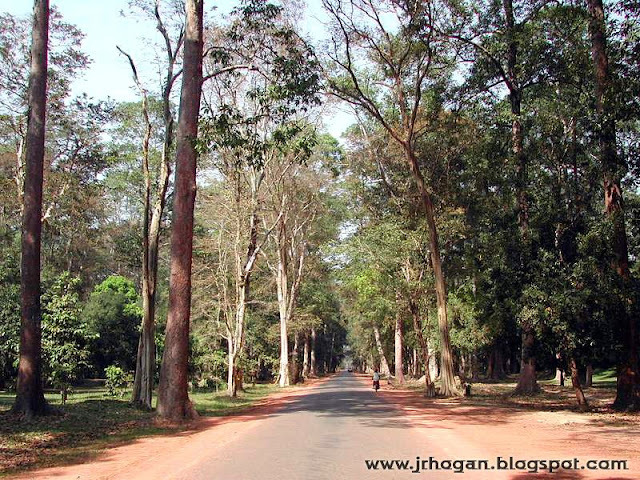 The journey there is relaxing with lots of trees in the Angkor Thom compound which is a 10 square kilometer city complex. 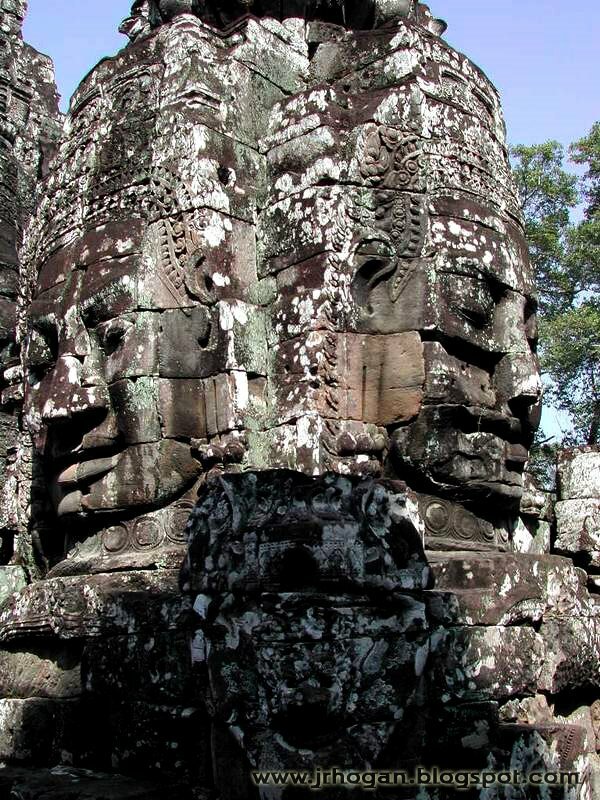 On reaching Bayon, you will be amazed by the huge structures that resemble faces. These stone face statues or structures are of Bodhisattva Avalokitesharva. The funny thing about these statues are that they are all smiling. 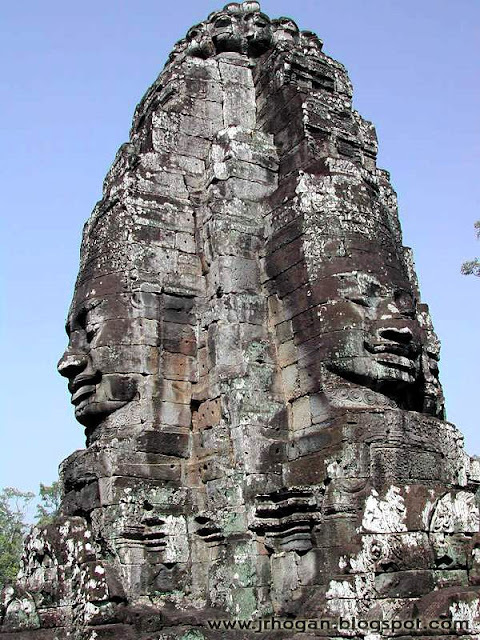 And there are to be 54 standing towers with these faces on four sides of each tower which are known as Face Towers but apparently only 37 are left. No, I did not count them. For those into photography, you could lose yourself in this lovely place. Tons of photo moments here and I would recommend you explore your camera here. My plan is to go back here again to fully photograph Bayon, this time armed with more interesting lenses. I would also advise on beating the crown when you come here. Usually the crowd would come here after the Angkor sunrise so if you have seen the sunrise on day one, then use day 2 to come straight here at 6.30am. That is what I did to avoid the massive crowds who will then make your photographing moments hell. One tip is to try an photograph the sun rising and hitting the Face Statues which could look really nice. Unfortunately for me, I totally missed that shot as I was mesmerized with the way the temple was made and how the carvings to the faces were done. Just outside Bayon there is another shrine with a large Buddha statue where the locals would be seen praying to this statue. From the picture you can see roughly how large it is. 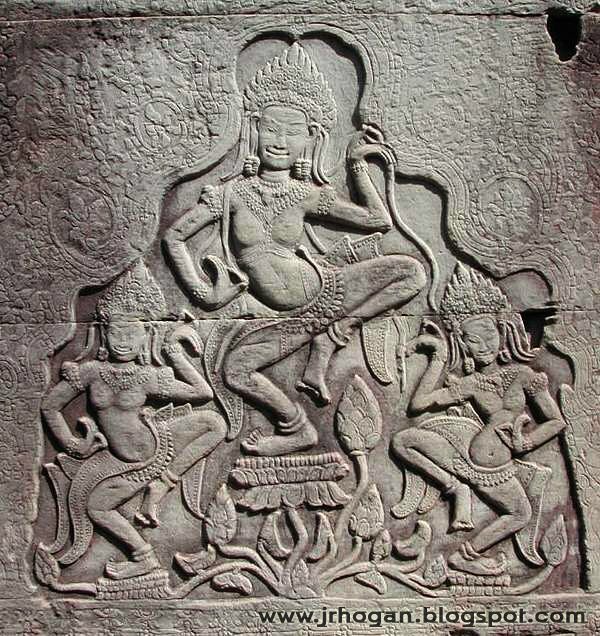 The Asparas or celestial dancers are seen on carvings around the temple. Such detailed works are absolutely amazing for something this old. One last tip for the temple seekers, if you only have limited time and want to visit a few temples, I would recommend you take a single day pass and see  Angkor Wat,  Bayon and  Ta Phrom. 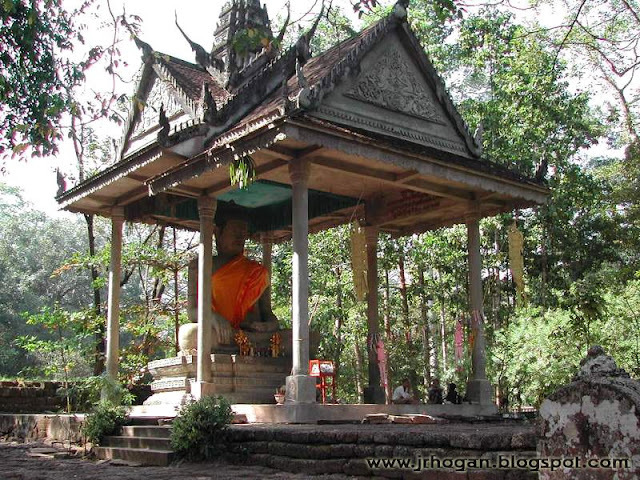 There are quite a number of temples in the Angkor Thom district and some are even located quite far so choose your temples for those with limited time there. For some food and drinks, head just north of Bayon and you will see some local stalls by the road selling food, drinks and souvenirs. Anyway, throughout the complex there are various places that sell souvenirs and f&b. Again, get your souvenir t-shirts around here as you may not see them being sold elsewhere unless things have changed much in the last 1 year. The Terrace of the Elephants or Elephant Terrace is one of those places worth visiting and photographing. This terrace was apparently used by the King of Angkor back then as a platform to view his victorious army returning or even for public ceremonies. Unfortunately my memory card was maxed out when I got here so I managed to take a couple of pictures only. 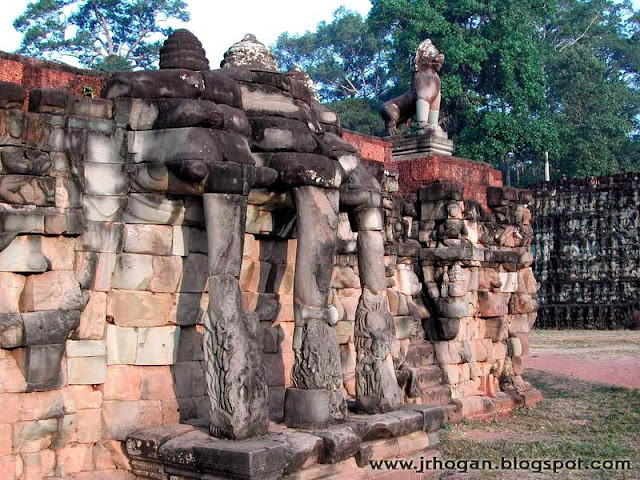 According to text, the Elephant Terrace was connected to the Palace of Phimeanakas of which only a few ruins remain. The original structures were made mostly from wood and other organic materials which did not last. So, only the rock sculptures remain. Fantastic place and you can spend about 20 minutes here before moving to the next temple. To get to Bayon or Elephant Terrace, your tuk tuk guide will bring you here as it is in the Angkor Thom complex. 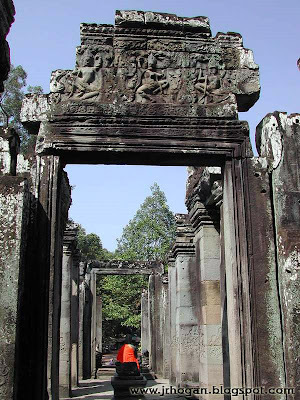 The Angkor Day Pass or 3 Days pass covers all temples in the Angkor Thom complex so you need not pay any more money. You only spend for the daily Tuk Tuk service or food, drinks or souvenirs here. Walking around thee temples can be hot and humid so carry water and wear comfortable clothing and shoes. Overall, I was quite impressed with my visit here as I never expected to see so much heritage in just one place. Don't forget to check out the other places here like Ta Prohm Temple, Angkor Wat and the famous Tonle Sap Lake. 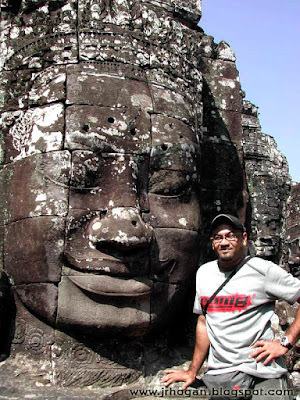 That being said, I still have to plan another trip to visit the other temples apart from Bayon Temple at Siem Reap, Cambodia. Siem Reap is a historical place in Cambodia. I could still remember, it was never ending for visiting all the temples around there... astonishing! Whoa bro u really went and explored all the places!i don't know if it was the weather or what..but i got tired of temples after the first day. shy la hahaaa. and LOL counting the 37 towers urself! ahahaha. Jess, it sure is. I am still not done. I plan for another trip to finish all the other temples there. ZQ, Hmm.. Ayutthaya sounds interesting. Should be in my plans. Has any one been to Autthaya? Hi all, in case anyone has not been to Ayyuthaya. I was there beginning of this year after the trip to Siem Reap. I have to say, that I was stunned and awed by the beauty of Angkor Wat and even its smaller temples. Ayuthaya was sorely disappointing to me. For Siem Reap, I did not have a guide and for Ayuthayya I did, still it did not impress. You can cover the grounds within 30 minutes. If you are interested, try to have the Ayuthayya trip inclusive of the Bang Pa In (Summer Palace). Now, that is beautiful and worth the trip. I liked reading your blog and wanted to know more about Siem Reap. Could you help me with that? I am going to Cambodia on September this year. Besides Cambodia, Thailand and Vietnam are also listed to be visited. But still I have a question about a hotel you might have seen during your visit in Siem Reap. I booked the following hotel: Tara Angkor Hotel. You know if it is a good hotel? I heard good stories about it. What are the best attractions to visit in Siem Reap and in the surrounding? I really liked reading your blog. Can you maybe help me with some questions? I am going to Cambodia on September this year. Besides Cambodia, Thailand and Vietnam are also listed to be visited. But still I have a question about a hotel you might have seen during your visit in Siem Reap. I booked the following hotel: Tara Angkor Hotel. You know if it is a good hotel? I heard good stories about it. What are the best attractions to visit in Siem Reap and in the surrounding? Hi there, to be honest, it has been a few years since my visit to Siem Reap and therefore cannot give you the exact hotel information. 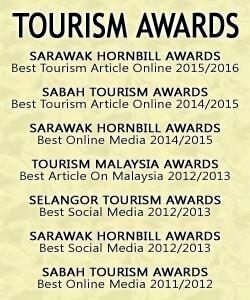 Tripadvisor would be a good choice for this. As for sights, The entire Angkor Complex is a must visit so prepare to spend a few days there. Tonle Sap lake is the alternative but if you dislike poverty, then I suggest skipping this. Thank you for responding. Ok i appreciate the honesty! I will reconsider my options. Maybe it is better to have a look when we are there. Further, I will have a look for the hotel at TripAdvisor. Thank you for answering. Ok I will have a look at their website. I think the Angkor Wat complex is absolutely a yes. It is already on my list. I want to see a lot of things in Siem Reap, I have to talk with my friends about the poverty. For me it doesn't matter. What about some restaurants. I heard that Tonle Sap, Mekong and Chaktomuk are being nice. Have you seen them? Or do I have to use the internet as well? I read your message and wanted to help you, because I have been in Siem Reap a lot of times. The Tara Angkor hotel is a beautiful hotel and is ideally and conveniently located, Tara Angkor Hotel is situated only 6 km from the Angkor Wat Temples, 15 min drive from the Siem Reap International Airport, a few minutes stroll to the Angkor National Museum and a short ride to the city town center with an array of Cambodian souvenirs, shopping and culture. They have a few promotions that you can make use of if you haven’t booked already: Last minute bookings, summer sales, early bird promotion or Angkor temptations. Of course there are a lot more, but have a look at their website. It is not that far to the Angkor temples that I would advise you to see for sure. I would say, grab yourself a 3 day pass and find yourself a decent tuk tuk driver to take you to the farther ruins and for a drive in some of the outlying villages. If you’re up for it consider renting a bike and checking out Angkor Wat on your own. There’s a lot to see and do so a lot depends on your time and budget. A few temples I would strongly suggest you check out besides Angkor Wat itself are Bayon Temple, Angkor Thom and of course Ta Prohm just to see the amazing tree. 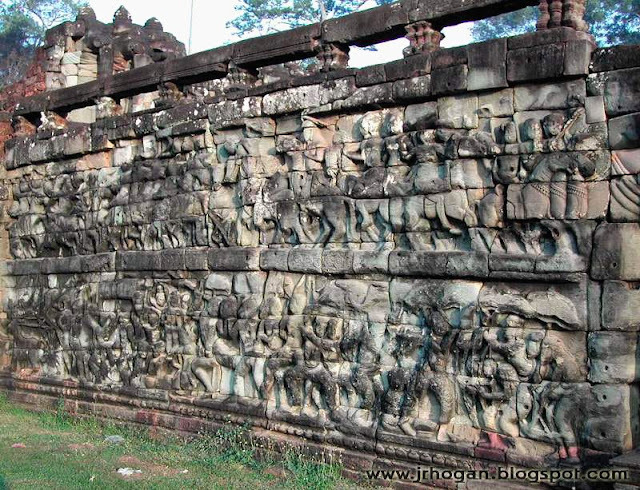 The Banteay Srei temple is farther out of Siem Reap but has a very different feel than a lot of the others. If you want to do something else as well, you can visit the day and night market. I can really recommend these attractions. If you need to know more, let me know.